Unique Best Friend Gifts from Captured Wishes! It's crazy. You know your BFF better than anyone else in the world... yet when it comes time to buy them a gift, well, you get stuck. Sometimes there are feelings which are impossible to capture. Words you cannot properly express. It all makes sense when you're with your friend, but shopping is just SO HARD. What to do? We've done it for you with this precious wish vessel. What's so cool about it is that it is ready to give. It describes your innermost feelings perfectly! And to make it even more interesting, your feelings are physically shown by using magic holographic glitter in the form of wishes! All you need do is provide an initial to super personalize it...when it arrives, all you add is your signature! BFF. Best. Friends. Forever. Easy to say, hard to capture. But now with Captured Wishes, we have created the perfect way to celebrate that special friend in your life. Our Wish vessel contains fairy dust, layered perfectly, and comes complete with a color key to explain what the symbolism and what the colors mean. And the verse puts feelings into words that you've always struggled with. 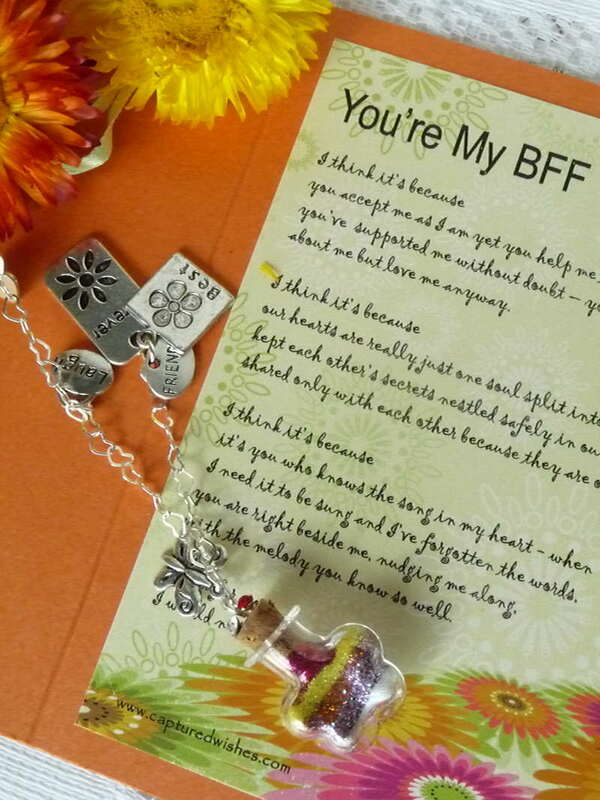 Give your BFF this unique keepsake gift, a physical and almost magical memento of what their friendship means to you. This gift comes with a suction cup hanger thingy (lol) so it can be hung on a mirror, a window, a fridge, a computer screen - almost anywhere! The flower-shaped bottle (25mm height x 20mm wide) comes complete with a suction cup, so your friend can hang it in a window or on a mirror to catch the light.